As a comparative philosopher and interdisciplinary scholar, Dr. Gregory Fields, professor in the SIUE Department of Philosophy, observes that indigenous traditions of natural and human history, literature, philosophy, religion, and healing remain underestimated in academic discourse. Many indigenous peoples relied on non-textual means of knowledge transmission, causing modern researchers to delve into non-traditional resources to explore and preserve indigenous knowledge. 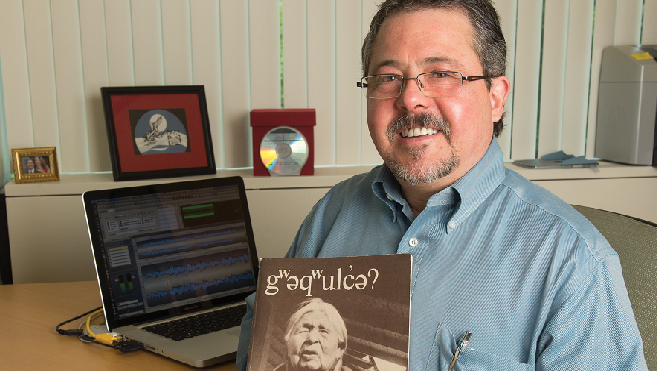 One such resource is the Metcalf Recordings, a collection of about 75 CDs featuring a preserved sample of Puget Salish language transcribed and documented by Dr. Vi Hilbert. Owing mainly to Hilbert’s work in publishing and teaching, Puget Salish language recovered from the edge of extinction. The Metcalf Recordings constitute one archival resource Fields is using to complete three books on Northwest Coast thought and culture. The upcoming books include: Totem Pole History: The Work of Lummi Carver Joe Hillaire, featuring Salish elder Pauline Hillaire’s documentation of the totem poles carved by her father (due for release in fall 2013); Rights Remembered: A Salish Grandmother Speaks on American Indian History and the Future, an ethnohistory 40 years in the making with Hillaire; and Fields’ current project, Sacred Breath: Pacific Northwest Culture and Medicine Teachings, a collaboration with Johnny Moses that explores the philosophy of healing and moral life in a spiritual tradition that takes seriously the need for physical, emotional, social, and spiritual healing. Fields has been making audio and video recordings since the 1990s, and each book includes a media companion, either a DVD or an audio CD. The multimedia format allows a presentation style that is more comprehensive and culturally appropriate to an oral tradition than text would be by itself. Fields is continuing his work in SIUE’s IRIS (Interdisciplinary Research and Informatics Scholarship) Lab using digital technologies for the humanities and social sciences — technologies that Hilbert referred to as “the new canoe” that would help carry ancestral languages and teachings to future generations.